Location: Ikaruga City, Nara Pref. Nandaimon (Great South Gate): Reconstructed in 1438. Chumon (Center Gate): Built in the late 7th century. Kairo (Corridor): Built in the 8th century. Kondo (Main Hall): Built in the late 7th century. Goju-no-to (Five-storied Pagoda): Built in the late 7th century. Kyozo (Sutra Repository): Built in the early 8th century. Shoro (Bell tower): Reconstructed in the late 10th century. Holds the Japan's oldest copper bell. Daikodo (Great Lecture Hall): Reconstructed in 990. Shoryoin and Higashimuro (worship hall and priests' cells): Reconstructed in 1284. Sangyoin and Nishimuro (worship hall and priests' cells): Reconstructed in the 13th century. Saiendo (West Round Hall): Reconstructed in the 13th century. Kofuzo (storehouse with raised floor): Built in the 9th or 10th century. Jikido (Refectory): Built in the 8th century. Todaimon (Great East Gate): Built in the 8th century. Yumedono (main hall): Built in 739 and reconstructed in 1230. Denpodo (lecture hall): Built in 739. To-in Shoro (bell tower): Built in 1163 and reconstructed in the 13th century. World Heritage registration: December 1993. The Buddhist temple of Horyu-ji in Ikaruga City, Nara Prefecture, was founded by the then Emperor's son, Prince Regent Shotoku (574-622), who left his name as an excellent politician in 607 shortly after Buddhism was introduced to Japan in the mid-sixth century from China by way of the Korean Peninsula. 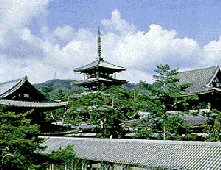 It is said that the original temple was destroyed by fire in 670, and the existing buildings in the temple's main compound, Sai-in (West Temple), are those which had been rebuilt and completed by 711. The other compound, To-in (East Temple), was built by 739 at the site of Prince Shotoku's Ikaruga Palace in dedication to the Prince. The Kondo, the main hall of Sai-in, was completed by 680, followed by the pagoda, the inner gate, and the corridor. These buildings are the world's oldest wooden structures still standing today. The structure and design found in these buildings were developed under the influence of Chinese culture of the 6th century. Along the corridor, there stand a bell tower and a sutra repository, and the Great Lecture Hall which was rebuilt in the 10th century. The main hall of To-in is called Yumedono, "Dream Hall," which is an elegant octagonal building. Yumedono, and the Denpodo, a lecture hall, and the priests' living quarters behind it date back to the 8th century. The corridor surrounding Yumedono, the Raido (worship hall), and other buildings were rebuilt in the 13th century. As wooden structures require careful, regular maintenance to preserve them, the buildings have been reconstructed and repaired every hundreds of years on a large scale. Between 1933 and 1953, all the buildings were dismantled and rebuilt, and restored to the original structures. There is no other example in the world in which outstanding wooden structures of different ages spanning from the 7th to the 19th centuries are concentrated in one area and preserved. Most of the temple buildings are designated as National Treasures or Important Cultural Assets. In 1993, the Horyu-ji and other Buddhist buildings in the surrounding area were registered on UNESCO's World Heritage list.